LAKE BUENA VISTA, Fla. – Like a fine wine that improves with age, the Epcot International Food & Wine Festival celebrates 15 years Oct. 1-Nov.
14 with an unrivaled global tasting experience. 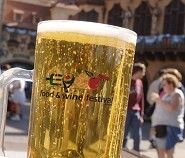 promenade at Epcot invite guests to taste tapas-sized portions and sip wines, beers and spirits from six continents. Argentina, Chile, Poland, South Africa, Australia, U.S.A., Spain and others. § A complimentary Marketplace Discovery Passport to be stamped at each international marketplace visited for the perfect scrapbook souvenir. § Daily wine seminars, bottle signings, author events and culinary demonstrations at the Festival Welcome Center. § Eat to the Beat! concerts three times nightly at America Gardens Theatre. band that can be worn conveniently on the wrist and used for purchases at park marketplaces, restaurants and shops. fan-favorite Taylor Dayne, and wrapping the event Nov. 12-14 is crowd-pleaser Big Bad Voodoo Daddy. participating in elegant dinners, luncheons, seminars and wine schools. · The Festival Welcome Center, with a Wine Bar, Authentic Taste Seminars, Authors Without Borders weekend conversations and more. · New events that include 3-D Disney’s Dessert Discovery and a festival preview night, First Bites Opening Reception, on Sept. 30. Showcase, new and updated restaurants welcome guests at the Italy, Japan, Mexico and China pavilions. cultural adventures, Marketplace Discovery Passport and all attractions and park entertainment are included with regular Epcot admission. details should be available at www.disneyworld.com/foodandwine by mid-July.